What can be said about Mr. Pish? The adorable, lovable, and charismatic traveling terrier has been capturing the hearts and attention of children and adults all over the world. His gusto for discovering new places and sharing them is infectious. All Mr. Pish books promote outdoor learning and literacy and are reviewed by a panel of seasoned educators before release. 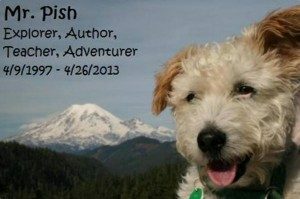 Mr. Pish passed away after his sixteenth birthday in 2013, and he is greatly missed. But with thousands of photos in the archives, his adventures will continue to be told for years to come. In 2011, Mr. Pish was honored to be awarded a spot in the Top 50 in the World of Dogs by FIDO Friendly Magazine. If you’d like to know more about the wonderful Mr. Pish, please visit his website, or catch up with him on his Facebook page.